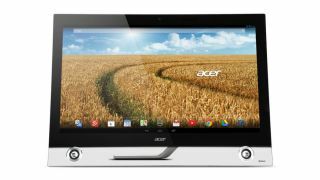 Acer has announced the launch of new TA272 HUL Android All-in-one desktop ahead of next week's CES 2014 trade expo in Las Vegas. Boasting a 27-inch WQHD display with a maximum pixel-resolution of 2560x1440, the new system offers 10-point capacitive touch support and wide viewing angles, according to Acer. The TA272 HUL comes fitted with an NVIDIA Tegra quad-core processor that clocks up to 1.8GHz, 16GB internal memory and dual-band 802.11a/g/b/n wireless. It runs Android OS 4.2 Jellybean that looks to deliver the Android experience on the big screen and also includes Windows 8 certification. Its design features a transparent base and asymmetric stand that goes for a modern and minimalist look. The stand allows the frame to be positioned from 30 to 80 degrees tilt, and the machine itself features two front-facing Dolby surround sound speakers and a 2MP webcam. On the connectivity front, the TA272 HUL offers a USB 3.0 port, HDMI and DisplayPort, allowing it to be connected up to other monitors. Acer said that machine gives owners access to its cloud-building service, called Acer Open Platform, which lets people create their own clouds to access music, photos and other types of content on multiple devices. The Acer TA272 HUL all-in-one is shipping worldwide with a retail price of $1,099 (£668, AU$1222). What did TechRadar think of Acer's latest tablet offerings?